Add Another Cat (or Small Dog) to your in-ground fence. 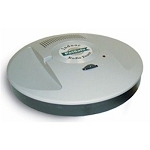 Works with the In-Ground Cat Fence, Indoor Cat Barrier and all PetSafe In-Ground Fences. 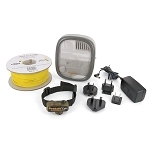 This receiver/collar is specially designed safety collar with nylon web construction with an elastic safety strip that will stretch in those instances where your cat is exploring in a tight place. You can increase or decrease the correction to meet your cat's training needs. 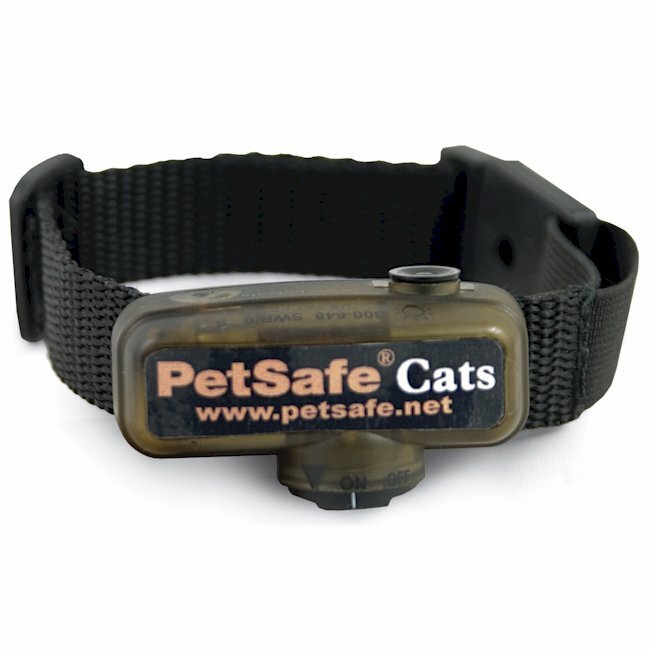 This collar is light and durable, and can be set strong enough for the largest and most stubborn cat. Product and Company are Teriffic! We've used the radio fence to keep our cats inside our screened patio and it has worked well. It's a very difficult task to contain cats so I believe our success is pretty remarkable. Also, when I have had a issue, I have always found the company to be extremely helpful. Neighbor starting baiting and trapping our cats so we bought the collars and in-ground fence. So far I don't think our cats have left our property again. The collars are working great. The battery has lasted a couple of months now. The only reason for the 4 instead of 5 is the size of the unit on the collar. It fits and it works well but I think it could be made much smaller and still remain fully functional. On/off could also be better instead of having to remove the battery. The collar says to keep on pet for no more than 12 hours which is also a big problem. We have to lock our cats in the garage at night and put the collars back on in the morning. We wired about 2.5 acres and I hate having to remove the collars and keep them locked in at night. While I think the batteries don't last long enough (WHY do you have to see a green light? Just put on the red light when the batteries are going out. ), The objections to the 12 hour limit are not correct. If you keep the prongs at their first size, yes. They would cause ulcers. Simply use a dremel and cut them in half. The collar should be tight enough to allow a SMALL space between. Trust me, when the cat approaches the wire, the buzz will hit her. You'll need about one week per month for about 3 months. After that, it'll be about a year before you need re-inforcement. Why does the setting change automatically? I followed the instructions to the letter, but found on multiple occasions that the "level" changed without my changing it on the collar. I don't have a good explanation for why, but ultimately, our cat learned to simply run when hearing the beeps. Even at the longest range, she figured a way to avoid it. We enclosed 2 1/2 of our three acres with the the in-ground (and along fence) boundary wire on the first of January. Our cats are Bengals -- short haired and slight build (8 and 10#), so the collar size looked a little intimidating, but they work wonderfully well. Had to go to the second setting for these confident, curious creatures. They usually go out about 8:30 am and come in between 3-5 pm (and only if we're home). Still on the initial batteries. The cats love their freedom -- running, wrestling, chasing lizards and climbing trees. I'm not concerned about the collars getting hung up. It would have to be a really freak accident. The fit is loose enough, and with the elastic, they could easily pull their heads out. Our boy jumps up on the table to get his collar in the morning. Our girl would love to sneak out without hers, but calmly resigns herself to its inevitability. These are high energy cats. The quality of life for them and peace of mind for us that this intervention provides is priceless. Why not 5 stars? The settings on the collar are difficult to read. I wish the "on" position were more positive. We have twice had "escapes" when we thought the collars were on but they weren't. A little smaller would be nice as well (tho these don't seem to inhibit the cats at all). I will be watching for new and improved designs, but I highly recommend this system. Cat collar? Why do I have to wear the cat's collar? Works great for my 7 pound Papillon. Not too heavy and absolutely effective at the lowest levels. He does not run free but this keeps him within catching range when he decides to chase a rabbit. Also have one for the 14 pound cat and it works great too. I do have to order batteries on line as the local pet stores don't carry them. Radio fence works for cats too! It is easier to train a cat to this collar/radio fence that I could ever believe. It's very comfortable to wear daily, so that we don't have to worry about the at escaping when a door is open. [...] I would definitely recommend this to a friend. Don't give up! The only difficult part in training is trusting success..at first. I put the fence in for our 3 cats. Our neighbor is a trapper of cats, after loosing two, we tried the fence. IT WORKS .... Admit I was skeptical and desperate. I could not be more confident. The training was speedy. Out of our 3 cats one proved to be a bit more difficult to train, which was only a matter of adjusting the level. Would highly recommend for cat owners. Radio Cat Fence is Great! We bought the in-ground cat fence for our two cats to keep them within a fenced-in yard. They both "learned" about the fence quickly and have not escaped in over five months. No longer have to worry about our cats being injured while roaming around the neighborhood. Great product! We have a cat that decided to start peeing on our living room furniture, over and over.......We tried everything to stop her. We were so frustrated that we contemplated putting her to sleep. We luckily were struck by inspiration and desperation. We ran invisible fence wire under the furniture, under the floor (we have suspended ceiling in the basement). She now has the run of the entire house, except for the area immediately surrounding the couches!!!! My 4 indoor cats pretty much destroyed my old house so when I moved to a brand new one I needed to control where they could go while giving them freedom to move around in allowable areas. I also needed to keep them away from a door to outside since my heavily wooded area would be dangerous to them should they sneak out. The cats adjusted to the collars in a day, I was surprised at just how fast they caught on and am still amazed at how well it works. We have 5 cats now and an in-ground cat fence around our backyard with a 3' high chain link fence. The collars work great. We installed the cat fence after our big boy got locked in the neighbors workshop for 6 days! We thought he was gone for good! So far they have all stayed safe in the yard. I use this collar to keep my cat away from my bird feeders. The training is stressful because you really need to show the cat how to avoid a shock. This takes some skill. However, my cat is now happily confined to half of my backyard. One difficulty I had was that my older cat was used to full access to the yard was very persistent in crossing the wire--she would surge over it! I ended up having to install a fence that forced her to stop and jump and the stopping caused a shock that she eventually avoided. My younger cat was not used to full access--I trained her with the collar as soon as she was interested in ranging out to the bird feeders. She was much easier to train; two attempts at crossing the line then no more. I have a small puppy who started to get too adventurous in the yard. My two other dogs at home have dog shock collars, but they each weigh 60lbs+. I knew for my small dog (5lbs now, will reach about 15lbs full grown) that that option wouldn't work for him. This collar works PERFECTLY!!! It keeps him in the yard with his brother and sister, but doesn't shock him enough to really hurt! The static option is great for small dogs! Q: We have an underground dog fence (Invisible Fence). Can this fence also be used to contain a cat? A: Containment systems can be used to contain both cats and dogs. However, this particular collar will not be compatible with your system if it is "Invisible Fence" brand. 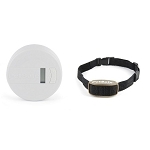 Q: Which transmitters is the PetSave Cat Fence Collar compatible with? 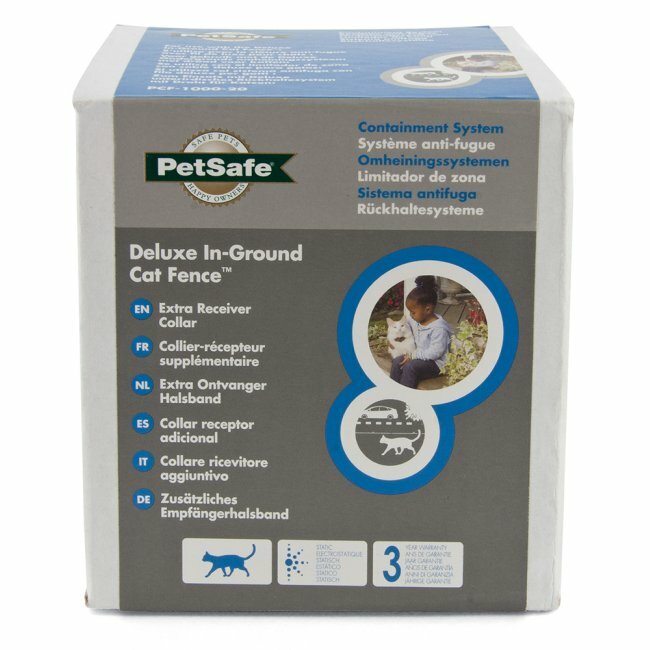 Q: Is it compatible with indoPetSafe Pawz Away Pet Barriers ? No this collar is not compatible with the Pawz Away Pet Barrier, but it is compatible with the Indoor Radio Fence transmitter.